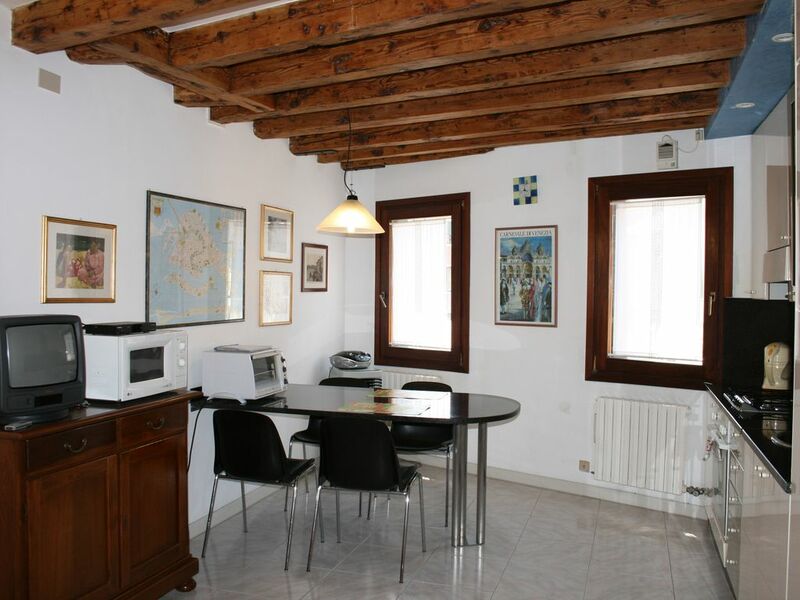 A lovely self-catering apartment situated on the second floor (fifteen steps up) in a characteristic building of Venice, near by the Biennale International Art Exhibition: it is brand new and well-lit with completely new furnishings. This flat is made up of an ample living room with wood beams, a fully accessoried angle for cooking and one double bedroom; it has a new bathroom with shower and there is a double sleeper sofa in the living room. Free Internet WiFi access is available. There are large, bright windows throughout the entire apartment. The windows of the living room and face a little venetian square in the district called Castello. The area is quite and very easy to reach, because it is a few minutes from the vaporetto stop called “Giardini”, no bridge to cross to get to. Close by there is the street “Via Garibaldi” full of well-stocked shop, bars, restaurants. The public water-bus stop (“Giardini”) is very important: many lines stop there (number 1-2-4.1-4.2-5.1-5.2-6-N night line) and assure any link in Venice and for the others islands (Murano, Burano, etc.). Apartment is composed of 1 bedroom with a double-bed, a large living-room with a furnished kitchenette and with a double sofa-bed and the bathroom (with shower). Self-catering. Please contact me using "Ask Owner a Question" to check availability before request booking. About the flat...: This apartment is ideal for people looking for a romantic and cultural holiday in Venice. You can easily walk to Saint Mark's square and interesting places of the city from this location, but far from noisy tourist quarters. The position is enchanting, close to the “Giardini” water bus stop (2 stops after San Marco), and also easy to reach the Lido beach. Very close you will find Via Garibaldi which is full of shops of every kind, bars, restaurants. The Giardini (Gardens of Venice) are known for the Biennale Art Exposition. 'Dear Frank, lovely apartment, enjoyed a great week in Venice. lovely the local market on via Garibaldi. Got everything we needed for self catering. Guests left some books and city guides in different languages. Note that the availability below is shown for the 'night of'. Great place to stay at great price! The first thing to say is that our flight was delayed and so we arrived fairly late on a Sunday night. Francesco was really helpful about how to get to the flat and was there to meet us off the waterbus despite the hour! He was friendly and gave us good advice about the flat and the local area. There was even a bottle of wine to welcome us! The property was spotlessly clean and had everything we needed for our stay. The price was fantastic for Venice - especially as it was Carnival. The local area had all the shops and restaurants you would need during your stay and was only a short (and very scenic) walk from St Marks Square. We thoroughly enjoyed our time in Venice and that was partly due to having a great base to come back to. Francesco et Nadia sont adorables. L'appartement est très agréable, lumineux, bien placé dans un quartier typique de Venise, et non loin de la place Saint Marc à pied. Il y a une rue très commerçante à côté de l'appartement, avec une supérette ouverte jusque 22 h ce qui est fort appréciable. Nadia parle parfaitement français ce qui a été pratique pour nous faire comprendre. Pas de doute, nous reviendrons ! We stayed in Francesco's flat for a fortnight. We thought the price (very low for Venice) might be too good to be true, but in fact the flat was perfect. It was lovely to be living among Venetians in a quiet campo, and even better to be a minute's stroll from lovely Via Garibaldi, with its excellent restaurants. Francesco is so helpful and considerate. Even in our late seventies (and my wife has mobility difficulties) we could easily walk to San Marco. Strongly recommended! Ease of booking and meeting up on arrival gives a welcome and restful start to your holiday in this lovely little apartment which looks out onto a small campo. Everything has been catered for in the apartment and outside on via Garibaldi there are all the shops you need, without having to scale any bridges! When you leave the apartment each day and emerge from the underpass, a perfect Venice scene awaits, with a small canal in front of you - with pretty brick bridge and beyond a tower of the Arsenale. To the left a short stroll takes you onto the calm and serenity of S. Elena - with its cathedral; and to the left, past the picturesque fruit and vegetable boat is the bustle of via Garibaldi, where there is a shady park and at the end of which is the superb vista of the Basin of S. Marco - particularly lovely at sunset. This was my third stay in this apartment, but I'm sure it won't be my last! Many thanks to Francesco and Dad! My partner and I thoroughly enjoyed our weeks stay in this lovely and charming Venetian apartment which is conveniently located near the Giardini vaporetto stop. It is well positioned in a quiet traditional residential area, and within short walking distance to the Biennale gardens/art exhibition area (2 minute walk) and St Marks square (a 10 minute walk on the beautiful waterfront). Reaching the other locations in Venice and nearby islands was also straightforward as Giardini is on most of the vaporetto lines. The apartments owner, Francesco, kindly met us at the stop and walked with us to the apartment while indicating on our map where to find the best bars and restaurants nearby. There was also a great list of written suggestions on where to eat and what to visit in the apartment. We were pleasantly surprised to discover how well equipped the nearby via Garibaldi street was too. It was lined with great restaurants, cafés and a large supermarket. We mixed with the locals there for the evening aperitif. The apartment is clean and roomy with a fully sized kitchen and dining area (perfect for us as we experimented with the local produce and cooked our own meals!). It also overlooks a lovely little Venetian campiello! It was a comfortable home away from home experience and I would highly recommend staying there. We would definitely stay there again. Great apartment in an area away from the tourists. Very warm & cosy ( we were there in Jan), with plenty of space in good size kitchen/diner/living room. Nice bedroom too. Francesco very helpful - met us from Vaporetto and gave us good advice. It's about 10 mins walk from St Mark's Sq and very close to good shopping street with small street market. All the shops you need within 5 mins walk + some restaurants. We really enjoyed our stay! The apartment is located behind the Biennale International Art Exhibition, near St. Mark's Square area. It's far less than 5 minutes on walk from the Giardini water bus stop (lines 6, 5.1,5.2, 4.1,4.2, 1, 2 and N night line). First-time visitors may be surprised that from Piazzale Roma onwards, all journeys are either on foot or by water vehicles: no cars, nor cross-roads or traffic lights! Venice is a labyrinth of foundations, narrow streets, squares, paved roads, channels, bridges and old channels that are now streets; it is not a large city, and it is quite possible to walk from one end to the other in an hour. In fact, one of the many joys of visiting Venice is simply walking through its alleyways. Waterways are as important in its life as the network of its streets: the canals filled with shallow water about 2- 4 meters deep, used by water buses, water taxis, gondolas and traghetti (gondolas with 2 oars used to cross the river), are spanned by bridges that connects both banks, often flanked by long narrow streets- the fondamenta- that run close to the foundation of the houses. Observing a map of Venice, you can easily notice that its shape is a fish crossed by the Grand Canal which divides the city in two parts connected by 3 main Bridges: the Rialto bridge made of stone, the Accademia bridge in wood, and the Railway bridge in stone. The luxuriant Venice, in days of silk and spices trade with Byzantium, is proudly portrayed by Vittore Carpaccio's paintings, which refined views of the city show the splendour of its architecture and life in the lagoon depicted as if all the tones of the spices (from ginger to cinnamon) coloured the lively alleys intoxicated by the bustle of foreign merchants, the swaying gondolas in the Saint Mark's pool, the myriad of bridges spanned at random between countless islands and even the centre of Venetian trades - Rialto Market. Venice enjoyed a uniquely ordered administration headed by the doge, an elected leader whose powers were minutely defined by the Venetians constitution. The Grand Canal snakes through the city creating 6 districts (San Marco, S. Polo, Castello, S. Croce, Dorsoduro and Cannaregio), and the splendid facades of the palaces that crown its banks testify to the city's history of immense wealth. Although their external decorations vary, the palaces share the same basic structure: the most decorated floors, the grand floor, housed luxurious salons used to entertain visitors; on the ground floor were stored the goods of the rich merchant families, and the upper floor housed the family during the winter. They were built with impermeable stone supported by timber pile that do not rot in the water lagged subsoil because there is no free oxygen that causes decay. Covering the Grand Canal by boat you can re-lived the enchanting of the old Lady, observing the lavish façades and their different styles. The influence of the Byzantine world is identifiable by their ground-floor arcades and horseshoe-shaped arched open galleries of the first floor and by their roundels with leaves or palm trees motifs. Gothic palaces are numerous in Venice: this style was characterized by the use of pointed ogee arches and carved window heads, trefoil and quatrefoil patterns (the most famous example is the Doge's Palace). During the Renaissance houses were often built in sandstone rather than traditional brick: lavish stone carving, a rounded central arch flanked by narrower side openings and bold projecting roof cornices are a features of this age. The exuberance show the influence of Baroque style: revelling in bold ornamentation that leaves no surface un-carved, cherubs and grotesque masks animate the main façade of buildings; recessed windows and massive blocks with deep ridges give solidity to the lower walls. Minimum stay: 5 nights. Prices are all inclusive except the tourist tax in force since the 24th of August 2011. The tourist tax is 3,00 Euro/night per person calculated for the first five nights and it is not included in the Rental amount. Rental rate is for 2 Persons. We adopt a no hidden costs policy. All prices include: Facilities in the apartment, Cleaning upon arrival and departure, linens and towels, accompaniment to the apartment upon arrival and a personal and friendly service to meet your needs.